Winding my way through Oxnard and Ventura I realized this was going to be a long drive since I was being held up by traffic on these small roads, and the towns were even slower. No worries, I had all day to get there and home. Good thing, because I had no idea what I was in for. Eventually I ran out of side roads somewhere north of Ventura so I got back on the 101 and drove the last 35 miles in top gear. 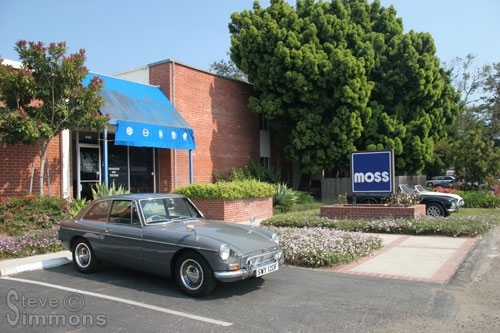 Arriving at Moss Motors I fell victim to my impulse buying and spent $190. I blame Moss for putting that rack of catalogs in the lobby. At least I got a free knockoff hammer out of their promotion for spending so much money. I spoke for a while with a gentleman who pulled up in a blue MGA, then grabbed some lunch nearby before heading home. Back on the road I got the bright idea to take back roads again. After all it was only 4:00 at the latest and I had all day. I made a left onto highway 154 toward San Marcos Pass which is a road I had always wanted to drive. Cedric was struggling a bit with the heat and the long grade, and I was disheartened when an SUV passed me and there was nothing I could do about it. Suddenly I saw a tiny road climbing steeply upward, and almost instinctively I turned onto it. I recognized the road name from a web site devoted to great driving roads in California, and I immediately discovered that this road truly was great! 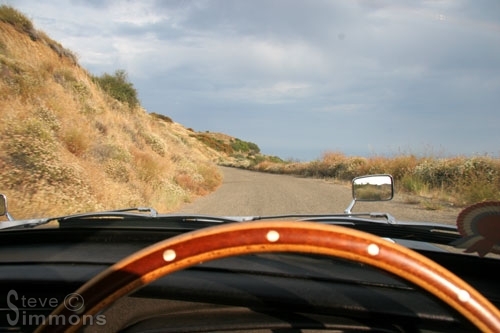 It was narrow, twisty and lightly traveled… exactly the kind of road I like! Many of the turns were extremely tight, requiring first gear and a lot of gas. The road climbed at an astonishing rate and I was having so much fun that I failed to watch the temperature gauge like usual. Eventually I did glance over and noticed it was at 220F! Uh oh, better back off. Slowing down didn’t help since the road was so steep that the car was always working hard. It climbed to 225 and then 230… yikes!!! I pulled off at a rare shady spot and let the car cool for a few minutes. 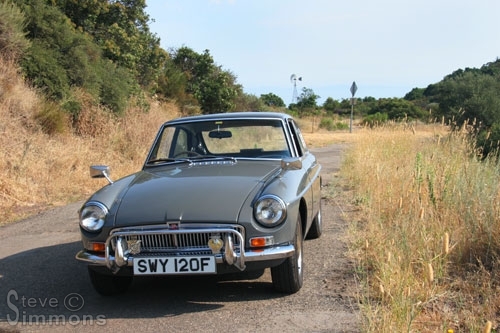 By the time I found the pullout my temperature was reading 100-pounds per square inch because the needle had gone past the end and into the oil pressure area! Thankfully the previous owner installed a sealed cooling system or I would have boiled over badly. Back on the road I took it a bit easier and the route eventually became less steep. It was still twisty and at one point in a switchback turn I encountered the steepest piece of asphalt I have ever seen. I would have stopped to take a picture but the car would never have start moving forward again if I did. I was truly shocked at how steep it was! 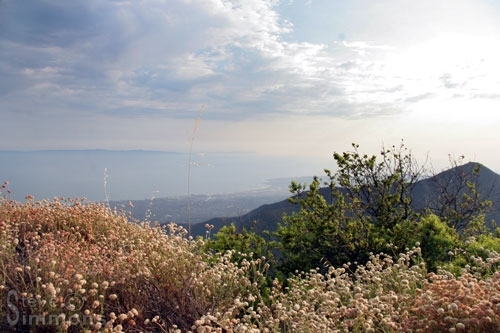 The road left the views of the Santa Barbara coastline and entered a heavily wooded area of oak, aspen and pine. The shade here felt great and I stopped to enjoy it, listening to the sounds of a stream running alongside the road just below me. At the end of this road I was confronted with a decision. 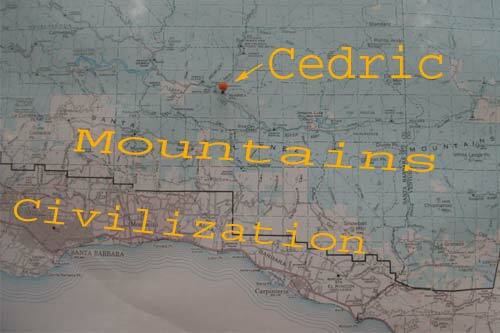 Left appeared to go to civilization and right went up higher and deeper into the mountains. No one was on that road, so the decision was made. Up we went along this tiny road, avoiding potholes like some kind of minefield. A sign read “Rough Road Next 14 Miles”. The tiny pieces of the road that weren’t potholes were actually almost smooth. Despite the lack of asphalt the views from this road were simply stunning. At 4,000-feet elevation, I could see all of Santa Barbara on my right and the Santa Ynez Valley area on my left. The road continued along the very top of these narrow mountains for miles and miles and offered one amazing sight after another. The potholes continued to worsen to the point that they could easily swallow an entire wheel. This was slow going and I wasn’t very happy with the thought of tearing parts from my car should I drive into one. 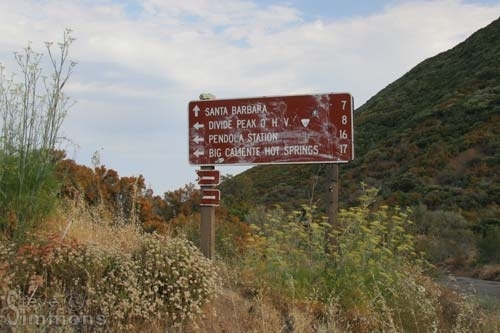 Finally I reached a sign which pointed right to Santa Barbara and left to Hot Springs. I sat for a few minutes deciding how adventurous I wanted to be with nearly 100 miles still left to drive home by the shortest route. I followed my rugged side and made the left, heading higher and deeper yet into the mountains. The scenery continued to offer wondrous views of ridges and valleys and the road continued in its quest to swallow Cedric whole. This went on for many miles when suddenly I was faced with the unexpected… the pavement ended. Another choice, do I continue onto the dirt road ahead of me or do I turn back? Turning around was not appealing since it was so much work navigating the mine fields for the past hour. I figured this road had to come out eventually so I went for it. The route descended into a canyon for many miles. Road conditions got pretty bad in spots and I was cringing over the really rough stuff. 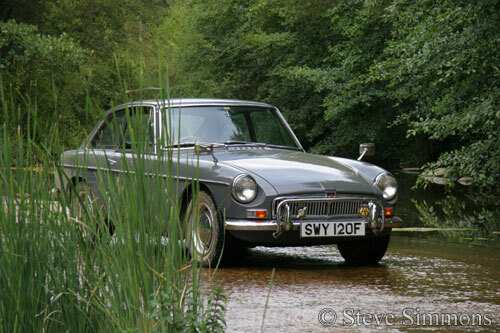 No problem, I’ve off-roaded in MGs many times before, just not in a show-condition car. The downhill sections were the worst, being rutted and rough. Some sections got rocky as well and I started to think about turning back. No, none of that, I’m not backtracking 20 miles to Santa Barbara through all that I had driven… just to be back where I started! So I continued on. At one point I saw a large deer run across the path ahead. He stopped about a hundred feet away and looked back at me. If I am any judge of deer expressions, I would say he was curious. 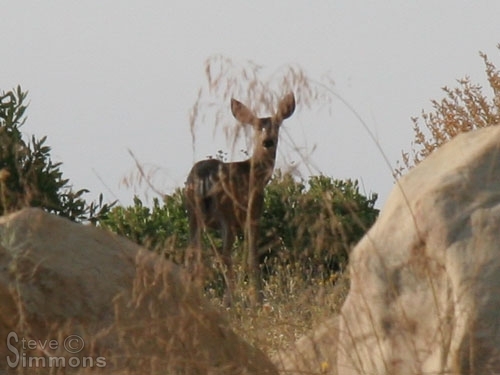 He stood there continuing to watch me for a while before wandering off into the bushes, at which point I continued onward, descending deeper into the canyons. Finally, some fencing appeared. Aha! Must be getting close to a main road! Rounding a bend I suddenly stopped in my tracks. There was a river in the road. I could see a concrete section but the river was running across it. Driving closer I realized it was very shallow and slow-moving. It was also very beautiful. As I approached I found myself completely secluded and surrounded by wildlife. There were ducks, turtles, frogs and birds, and there was me with my MG. This was truly amazing, one of those experiences you do not forget. There was no one around for who knows how far and more than likely no one else had been here in some time. This was really a remote and special place, and I stopped for some photos. I continued on for a short distance and came across a horrifying sight… a big metal gate across the road! Wait, there’s a way to turn left. But where does it go? Aha, a post with a map stapled to it! The map was useless since it was much too local to help me figure out exactly where I was, or where this next road went. I really, really didn’t want to turn back now since it would take an hour just to climb the dirt roads out of there and I had already abused poor Cedric enough. He was filthy inside and out and had driven some pretty rough terrain. No, I’m going to follow this next road. It looks much smoother. Continuing on I saw small telephone poles, a good sign! About a mile later I passed a 4-wheel drive truck on the side of the road. I may have stopped to ask where the road went but by the time I realized there was someone inside I was well past, and the guy had a really strange look on his face. 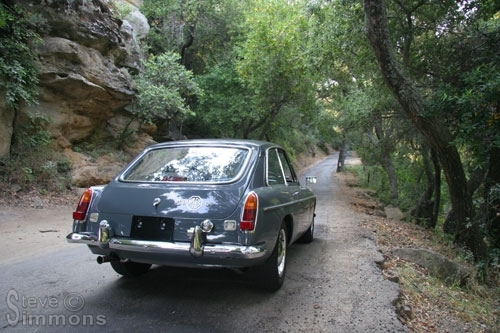 I’m sure he was either wondering what an old British sports car was doing way out here, or that he was an axe murderer. 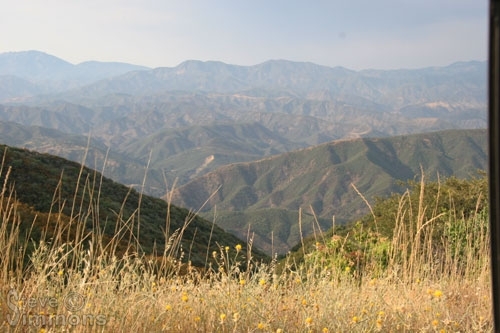 The road continued descending along the Santa Ynez River through beautiful meadows full of golden grass and yellow flowers, oak trees dotting the landscape and pines covering the hillsides all around me. The sky was turning a beautiful orange as it prepared for sunset. This was truly amazing and I took it all in as I drove along. Wait, did I say sunset? Holy cow, I need to get out of here sooner rather than later! A sign appeared ahead at a fork in the road and it had directions! Upon closer inspection I saw that it only had mileages to places on the road to the right, which according to the map I found earlier was a dead-end road. The other road, heading straight, was the only other option but I had no idea where it would lead. There appeared to be a ranger station just around the bend (which is where the telephone lines ended) so I drove to it. By the looks of things the ranger station had not been lived in for some time. On the side I discovered a large area map posted on a sign. Finally I could get my bearings straight and figure out the best way to a main road! But the news was grim… the fastest way out, by far, was to turn back. *gasp, choke* This can’t be right! Double-checking… yep, it’s right. 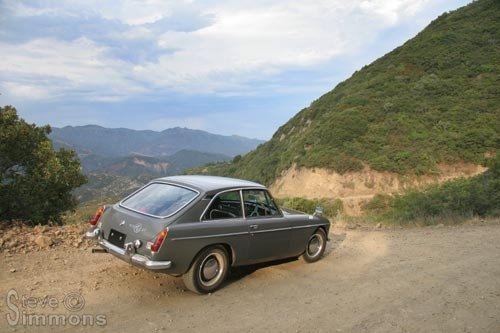 I had driven straight into the heart of the Santa Ynez Mountains and the only way out was to climb out of this valley. There were two ways to do that and one of them was twice as far as the other, and on roads I had not yet seen. I had a hard time swallowing the fact that I would have to put Cedric though all that again, and for nothing. I should never have listened to my adventurous side. Here I was with one hour to total darkness and I was in the middle of nowhere on unpaved mountain fire roads. So I did the only thing I could think of other than suicide, I got in the car and turned around. Driving back I was making pretty good time since I remembered which sections were smooth and which were rough. I found that on the smoother parts driving faster produced a much better ride, and this was a good thing! I passed the guy in his truck again and he watched me go by this time with an even stranger look on his face. I passed the meadows, the telephone poles and eventually crossed the river again, the whole time cringing at the thought of this all being for nothing. Climbing the rough sections out of the canyon was much worse than descending them and Cedric was really getting bounced around. The headlights came on and things began to look different in the dim evening light, in addition to being seen from the opposite direction. I tried to make good time but it just wasn’t possible and a couple big bumps reminded me of that. I got another fright when two deer darted into the road in front of me. When they saw me they were so spooked that they leapt nearly straight up the hill to my left and continued jumping up what was practically a cliff, eventually disappearing from sight. It was an incredible thing to see and gave a real impression of how powerful these animals are. They appeared weightless despite their huge size. More driving and less light was the name of the game for the next half hour when suddenly a road appeared. It was the crappy pothole road! Finally I could get poor Cedric onto a familiar surface. The road surface felt wonderful despite how much I hated it before. Compared to what I was on this felt like the smoothest surface I had ever driven upon. 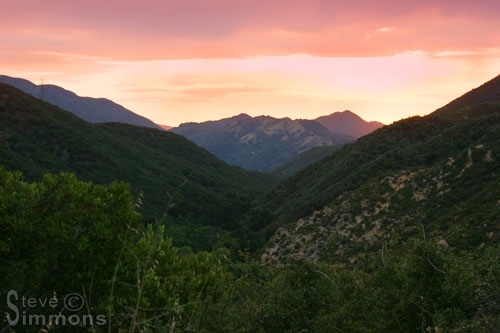 There was more light now that I was out of the canyon and as I crested onto the main ridge I was presented with a deep red sun setting below colorful clouds in an amber sky. This was a really beautiful sunset and it came at just the right time. I let the beauty of it all sink in and continued on through the mine fields for a few miles. It was slow going as the sun set and the car-consuming potholes disappeared into the shadows. Finally, as if it was a gift from God, the fork in the road appeared where my “adventurous side” had taken over earlier in the day. I cursed my adventurous side and turned onto the road I should have taken. The pavement improved more as I descended towards the lights of Santa Barbara. At 8:45 PM, tired, dehydrated and nearly back to civilization, I came to a crossroads. Straight would take me downhill to the freeway. 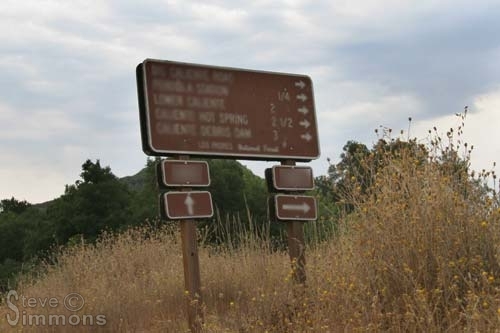 Left was highway 192, a small twisty back road which winds through the foothills. Which road would you have taken? See more photos from this adventure on Cedric’s photo page.